Now with ProControl pressure control! New Tilt-N-Spray pendulum suction tube! This paint sprayer is fully rebuildable! More powerful 20V Li-Ion battery! This is the 2nd generation of the popular TrueCoat hand-held airless paint sprayer. There are many new features and changes to make it the best handheld sprayer you can buy. Now also available in an electric / plug-in model - TrueCoat Pro II Electric. Put Pump Armor in the TrueCoat Pro II to protect the internal pump and components from corrosion. Can also be used as a start-up tool - clear the intake valve and prime at the same time. Now all parts and modular components can be replaced which can extend the life of the whole cordless paint sprayer. Fits into tighter areas better with smaller, more packed design. 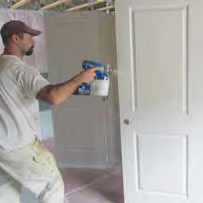 Pro quality finish like Graco's Contractor Grade paint sprayers.